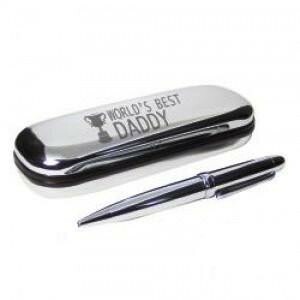 This is a beautiful, stylish, silver brushed pen, a perfect gift for a new daddy. This set includes a ball point pen and box and features a trophy motif. The wording 'World's Best Daddy' is standard text. Ideal for New Dad's, Fathers Day and Birthday's.